Sometimes I love how much weather can influence my mood, activities and food choices. It truly makes me feel so in touch with my surroundings and brings me back down to earth. We were experiencing some pretty cold temps for San Diego and then suddenly, a couple weeks ago everything cleared up and we had some gorgeous 80 degree days. A lovely treat in the middle of February! Of course yesterday, it got a bit chilly again and started to rain! My response? Soup of course! This creamy (dairy free!) soup is pretty irresistible. 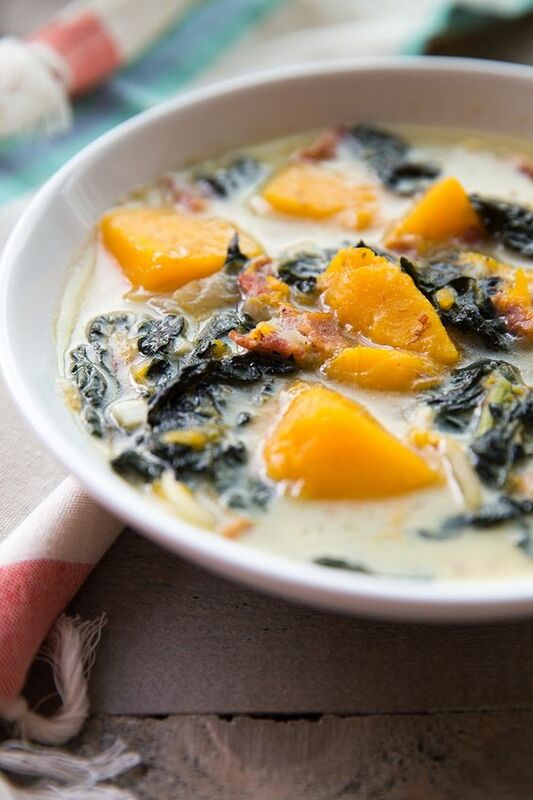 I had some extra kale in my fridge and some butternut squash leftover from my Dairy-Free Butternut Squash Lasagna and I was inspired to make a creamy, rich soup. I didn’t really have any meat on hand, just bacon, but it worked perfectly and resulted in an almost chowder-like soup. This soup is quite simple to make and I wouldn’t be surprised if it became a staple in our house! Slice butternut squash long ways, scoop out the seeds and rub olive oil onto the squash, followed by a bit of salt and pepper. Line a small baking sheet with parchment and place squash face down. Bake for 30-40 minutes until soft. The squash doesn't have to be totally cooked because it will cook more once you add it to the broth. But it should be at least 80% done when you remove it from the oven. 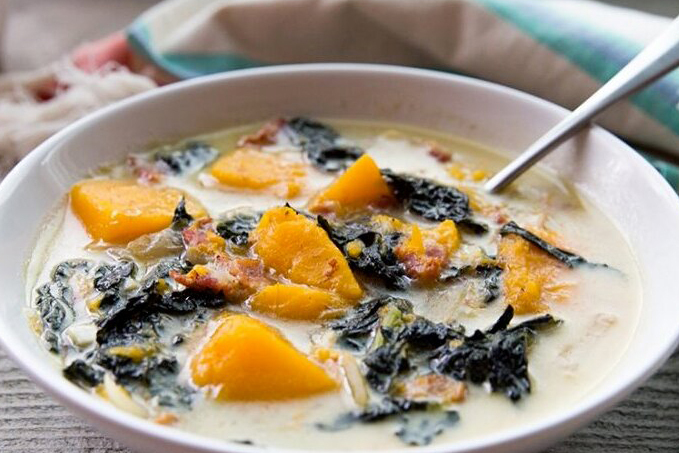 While the butternut squash is baking, chop your onion, garlic and bacon. In a heated, large skillet add bacon pieces and cook until slightly browned. Add onion and cook until translucent, followed by garlic. Be careful not to burn the garlic! 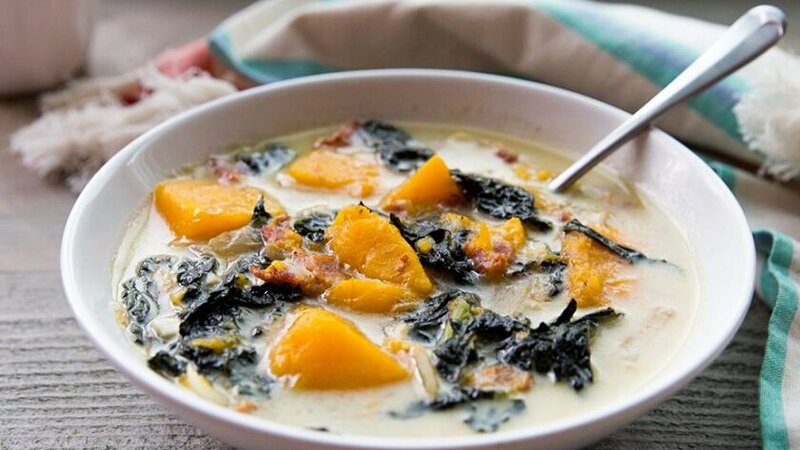 Once onion, bacon and garlic are mostly cooked and softened, add coconut milk, chicken broth and broken kale leaves. Mix well and simmer on low until your squash is done. Remove butternut squash from the oven and flip so that it cools quickly. Once relatively cool, gently peel or slice the skin off the squash and cube the cooked squash. Add squash to soup and add some salt and pepper to taste. Simmer for about 15-20 minutes to enhance the flavor and serve! 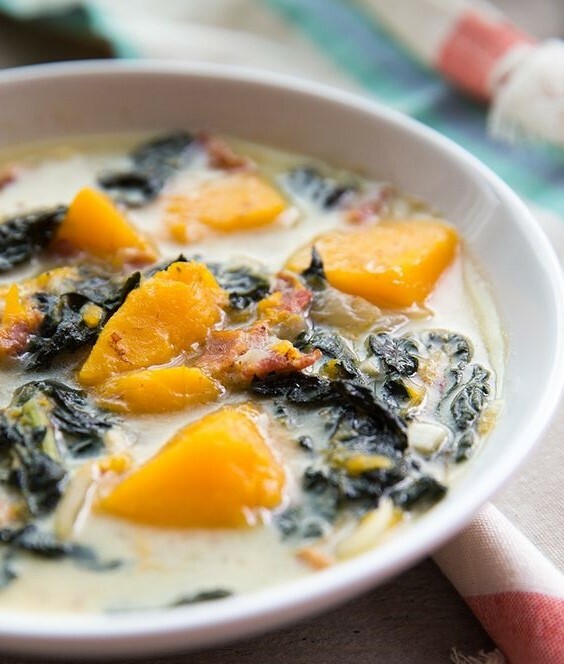 In response to this recipe, when would you add the kale to the soup? and do you steam the kale or cook it any way before adding? Hi there! Sorry about that, looks like that step was left out. All set now!